Sri Aurobindo's multi-faceted genius is not easily fathomed. The world knows him primarily as a Mahayogi. He was also a superb poet in English and achieved the impossible by producing a great philosophical epic in Savitri. Almost fifty years a-growing, the epic poem takes up the secular legend of Savitri and Satyvan found in Vyasa's Mahabharata and retells the tale in terms of man's evolutionary advancement and the possibilities of his great future on earth. 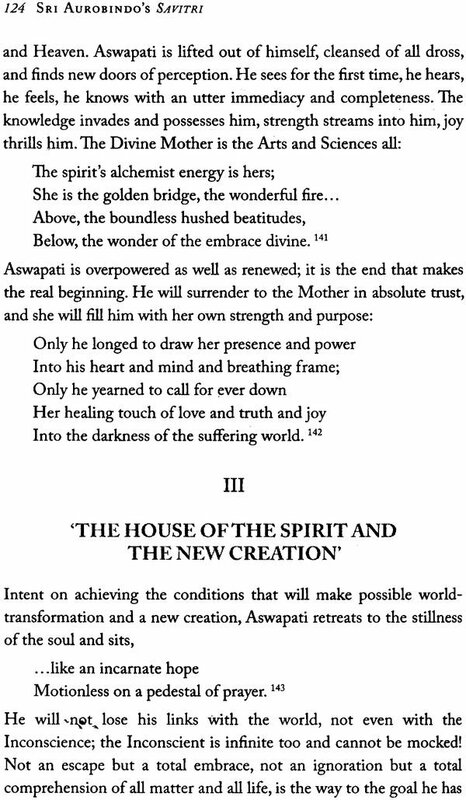 Savitri by itself, Savitri in relation to Sri Aurobindo's life and work, and Savitri in relation to the great epics of the world and even in relation to the currents of human thoughts and experience of all times: these are the three ascending terms in the argument in Sri Aurobindo's Ssavitri, A Study of the Comic Epic. 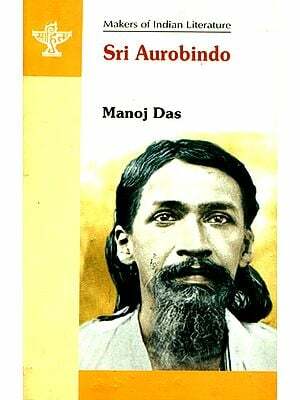 At a time when is a widening interest in Sri Aurobindo's poem, this trustworthy volume will be a great help to aspirants the world over. Savitri is the record of a seeing, an experience which is not of the common kind and is often very far from what the general human mind sees and experience...there must be a new extension of consciousness and aesthesis to appreciate a new kind of mystic poetry. Dr Prema Nandakumar obtained her PhD in 1961 for her study of Sri Aurobindo-'s epic poem Savitri. Since then, she has been an independent researcher, publishing critical and biographical works. As a translator, her career spans fifty years, with UNESCO publishing her book on Subramania Bharati. Dr Nandakumar's translation of Manimekalai, the ancient Buddhist epic from Tamil into English, She is also a creative writer in English, has been received with enthusiasm. She is also a creative writers in English and Tamil. Her latest publication is K.R. Srinivasa Iyenger, a monography on her father for Sahitya Akademi, New Delhi (2008). Dr Nandakumar is a resource person at various national and international conferences and seminars in India and abroad, including two international conference on Tamil Studies, the first International Conference on Buddhism and National Cultures, and seminars on eminent literary personalities like Subramania Bharati and Sri Aurobindo. In addition, Dr Nandakumar is a frequent keynote speaker and draws her inspiration from sources and varied as the Vedas, ancient Hindu and Buddhist epics, ancient and modern Indian literature. She is a recipient of several awards, including the Sri Aurobindo Puraskar, Manimekalai Award and Panditha Ratna. Dr Nandakumar's English style is fluent, always readable and sometimes eloquent. Her book is based on a wide literary culture... All student of the work of Aurobindo and indeed of the spiritual of modern India must be grateful to Dr Nandakumar for this intelligent and sympathetic guide to the masterpiece of a poet whose work is still too little known outside India. During the last fifty years, Savitri has been increasingly gaining its rightful space in Indian academia. Several dissertations have been submitted in various universities with signal success. Eminent orators like Ambalal Purani and M.V. Nadkarni have taken the epic poem all over India and abroad to enthusiastic audiences. Innumerable books on Savitri have been published. There are also web sites exclusively devoted to studying the poem. 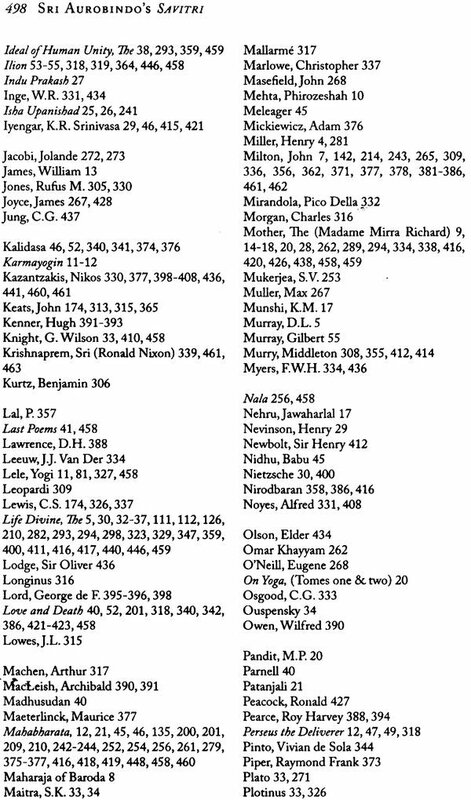 And yet I have been repeatedly asked for copies of my book which apparently continues to be of significant help to the student of Sri Aurobindo's epic. This is how Sri M.L. Himatsingka kindly acceded to my request and brought out a paperback edition in1985. For the last fifteen years and more, the book has remained out of print, though the demand has continued. I am grateful to Sri S.G. Gautam for initiating the idea of this new edition. I was delighted when Sri Vijay of Sri Aurobindo Society came forward to set off the process for its publication. This I do consider as a direct ray of grace from the Mother as the book is being issued during the golden jubilee of the Society. It has also been a joy to work with the young and enthusiastic helpers in the task of production, Krishna, Gita and Vilasni. Nandita Jaishankar's attention to detail as an editor has been of great help. I am deeply thankful to Shobit Arya and Sapna Rangaswamy for publishing the book under the auspices of Wisdom Tree. My mother, deeply devoted to Savitri which was her life's companion, was looking forward to this new edition when she merged with the Mother in 2007. Her angelic spirit is sure to be delighted for she was always my first reader and critic and tireless correspondent. My husband Nandakumar, and our children Ahana, Bhuvana and Raja have been the source of light and laughter in my life. It is a special joy to thank them formally. Though I have published several books after A Study of Savitri, this work remains very close to my heart. The work gave me the honour of being the first student to take up the epic for doctoral study. I owe to my father all that is in it. I can see and hear my father in the book, as he explained to me the poem, helped me plan the work and guided me to the right books on literature and philosophy in the Andhra University Library. He patiently corrected my manuscript, cheered me up when I felt despondent and curbed my enthusiasm for a flowery style. When the first edition was in the press, he went through the proofs with me which was in itself a lifetime's education. Indeed I see my entire life in this book ever since father read the complete Savitri at home using the one-volume university edition which had been published in 1954. And the two days in November 1959 when Ambalal Purani kept the 1000-strong student-listeners of Andhra University in the Erskine Square mesmerised by his speeches on Sri Aurobindo and Savitri. The audience with the Mother after my thesis had brought me the doctoral degree, the publication of the book, my post-doctoral work on Sri Aurobindo and Dante Alighieri growing out of one section in this book, my days spent in reading Sri Aurobindo and writing about him guided gently by my father are all entwined in its pages. It is all due to Mother's grace and I bow to her in gratitude. More than half a century later, I marvel how Savitri has been a guardian "angel of the way" for me, and I have not lost any of the hope, the wonder and the faith instilled in me by my father in those early days of studying the poem. Towards the Greater Dawn then! Long out of print, A study of Savitri now comes out again, and I am grateful to Sri M.L. Himatsingka, the indefatigable and dedicated spiritual behind All India Books and VAK: The Spiritual Bookshop for it. Doubtless several books on Savitri have appeared during the last two decades, notably by M.P. Pandit, Rohiy Mehta, Syed Mehdi Imam, and Rameshwar Gupta; but I have also been receiving all these years repeated queries regarding the reissue of my work. 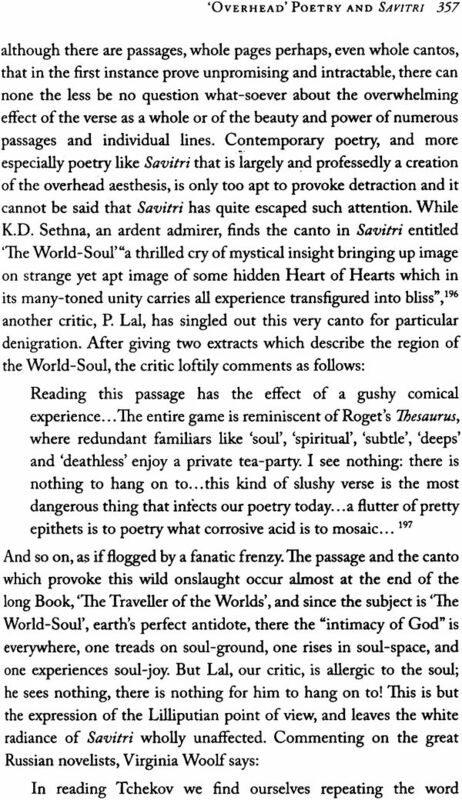 I therefore venture to think that it has, perhaps, a place of its own in the growing critical literature on Savitri, and deserves this new lease of life. 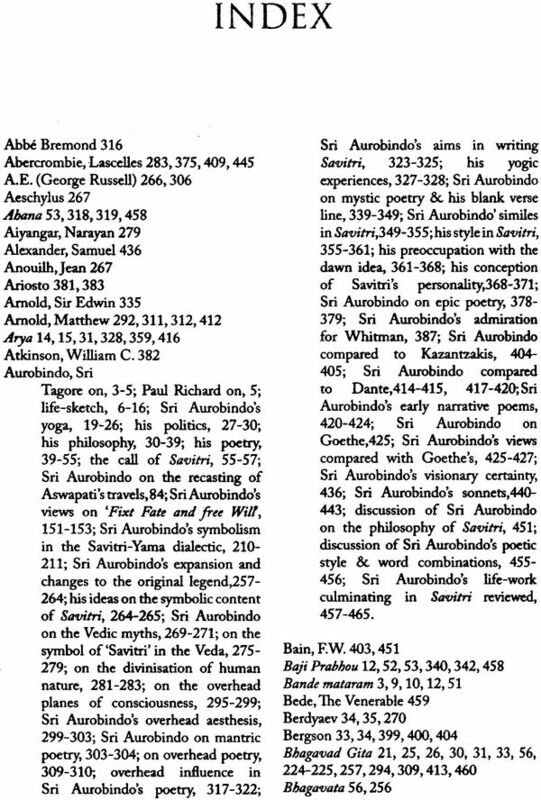 I may add that, following this work and helped by a UGC post-doctoral Senior Fellowship for three years (1967-70) at Andhra University, I competed a comparative study of Dante's The Divine Comedy and Sri Aurobindo's Savitri. It appeared first serially in Sri Aurobindo Circle Annual (1972-78) and later in book form (1981). 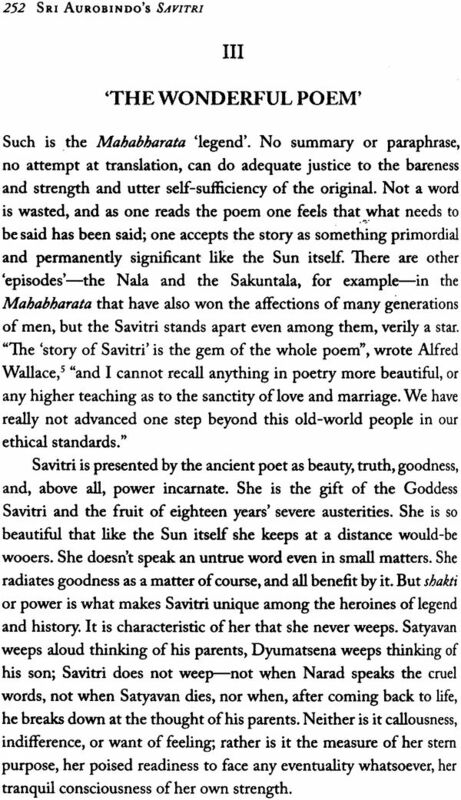 But Savitri remains inexhaustible, embodying in its nectarean message "an immortal Sunlight radiating over the future". And our 'critiques' are no more than humble approaches and offering. In the end one surrenders to the poem itself, and its alchemic power and glory. This book is substantially the same as the thesis for which the Andhra University, on the unanimous recommendations of a Board consisting of Professors Vivian de Sola Pinto, H.O. White and T.J.B. Spencer, awarded the Degree of Doctor of Philosophy on me at the Annual Convocation held in December 1961. The present publication has been kindly sponsored by the Andhra University, with the help of a grant-in-aid from the University Grants omission (UGC), and I am duly grateful to both my Alma Master and the UGC for thus facilitating the publication of this book so soon after the award of the Degree. During the last several months I have been asking myself why, having wavered for quite some time between Virginia Woolf and Savitri as my subject for the PhD course, I finally chose the latter. I should perhaps say rather that whereas I chose Virginia Woolf, Savitri chose me, Sir Aurobindo's portraits adorn the walls of my parental home, and I have grown up in silent and reverent admiration of the Master. As a girl I was once privileged to visit the Sri Aurobindo Ashram at Pondicherry. And which Hindu girl reacts otherwise than with love and gratitude towards the mythic heroine, Savitri. That I should wish to study Sri Aurobindo's Savitri was thus not surprising: what was really surprising was that I took so long to reach a decision which, once made, seemed altogether the right thing. My first postgraduate enthusiasm had been the great Tamil poet, Subramania Bharati, some of whose poems I translated into English and published as Bharati in English Verse. 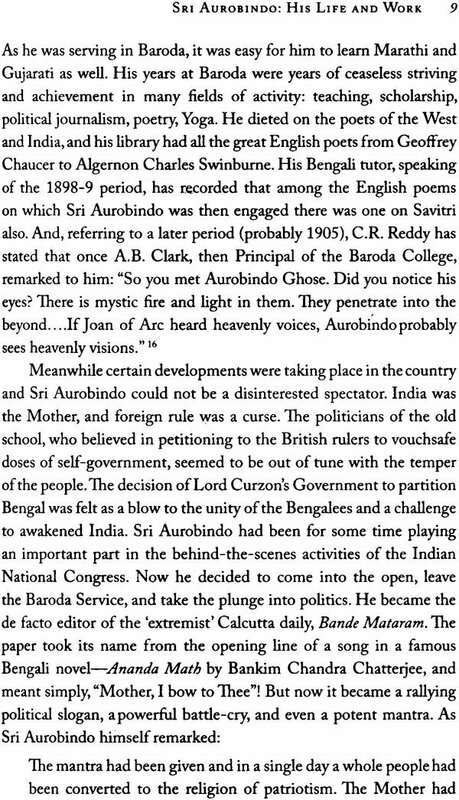 Now Bharati had been Sri Aurobindo's intimate friend at Pondicherry for about ten years, and what could be more appropriate than my turning from Bharati to Sri Aurobindo? There has been no end to my good fortune. Firstly the subject itself, which I now think is the greatest-the most inspiring-that a woman, at any rate a Hindu woman, could think of or write about. Secondly, I have had constant advice and help from my father, Prof K.R. Srinivasa Iyengar, who is not only the author of the standard biographical study of Sri Aurobindo but is also one of the eminent authorities on the subject. Thirdly, the UGC were good enough to award a research scholarship that enabled me to prosecute my studies without saddling myself with teaching duties. Fourthly, in November 1959, Mr A.B. Purani the author of the only book on Sri Aurobindo's Savitri was our guest for a few days and gave on 25 November an inspiring lecture in the University on Savitri. Having been closely associated with Sri Aurobindo for about thirty years, Mr Purani is one of the very few people who can talk with real authority on the Master's thought and message. I was privileged to discuss the plan of my book with him, clear up several of my difficulties, and even to look into some of his private lecture notes on Savitri. Finally, certain review- assignments by Madame Sophia Wadia for the Aryan Path and the Indian P.E.N enabled me during the last few years to read and write about Sri Aurobindo's posthumous publications-notably Ilion and the plays-while Sri Nolini Kanta Gupta, Secretary of the Sri Aurobindo Ashram, gave me no small encouragement by publishing my first essay on Savitri ('The Exordium') in the quarterly journal, The Advent. On the other hand, the more I studied, the more I began to feel bewildered. 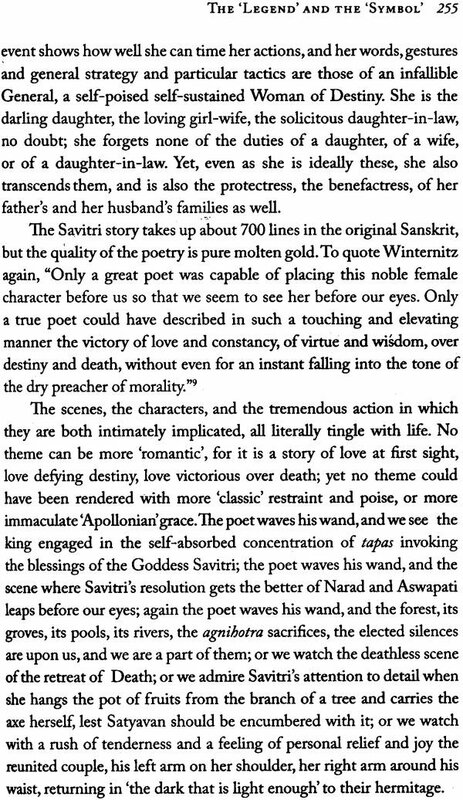 Savitri is a colossal poem of nearly 24,000 lines. The mere attempt to 'understand' it left me often despairing whether I would ever be able to bring my project to some sort of conclusion. I was for a while quite lost in Aswapati's 'Worlds', and the 'Descent into Night' was a terrible experience. But I persevered and my father was always there to help me whenever I floundered. The collateral studies took me to vast new oceans of knowledge. There were Sri Aurobindo's own works, formidable in their bulk and weight and manifoldness of knowledge: I was advised to read Evelyn Underhill's classic treatise on mysticism, and this took me to other books on mysticism and the great mystics. I also took deep draughts from the springs of modern English and American poetry. Browsing in the University library, I read whatever seemed to have relevance to my subject in its wider perspective, and took numerous notes and carefully card-indexed them. As the months passed I had the feeling of a person who has foolishly ventured far into the sea and finds, whichever way he turns, nothing but an endless expanse of water. The shore seems to be nowhere. I could have gone on reading and taking notes for a lifetime, for one subject led to another and to another still, and all seemed relevant enough to the study of a 'Cosmic' epic like Savitri. But I realised at last that I must really put my notes in some order, plan my book and start writing it. First I attempted a verse play on the Savitri theme, more as an exercise in understanding and interpretation than as a serious literary effort. Next I turned to Part II of the present thesis. Mr Purani's 'Summary' was very useful, of course, but since he is a tried sadhak or initiate of Sri Aurobindo's yoga, many things that are perhaps self-explanatory to him seemed at first puzzling in the extreme to me. 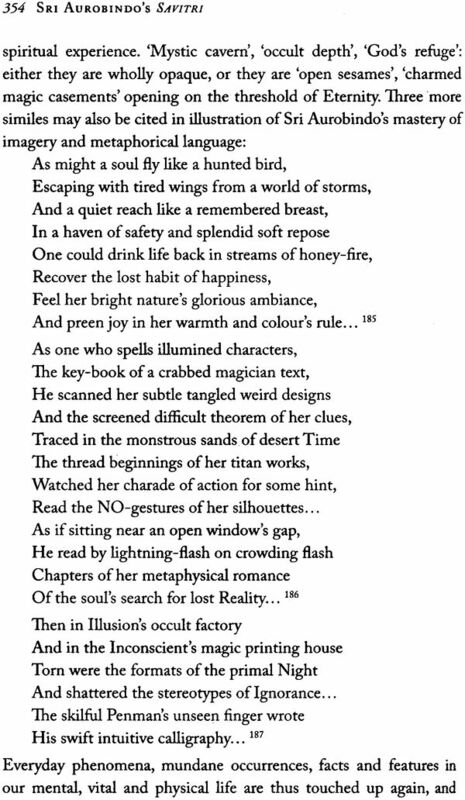 But repeated re-readings enabled me to complete this Part which is more or less a critical synopsis of the poem. I now turned to the original legend in the Mahabharata and made my own rendering, though I found the prose versions of Pratap Chandra Roy and John Brough as also the verse renderings of Sir Edwin Arnold, Romesh Chunder Dutt and TOfU Dutt useful for one reason or another. Parts of the chapter 'Overhead' Poetry and Savitri were presented as a paper before the English Faculty Research Seminar on 12 March 1960.The final chapter on Savitri as a 'Cosmic Epic' took me to other epics, ancient and modern, and I had an enchanting time exploring these 'realms of gold'. 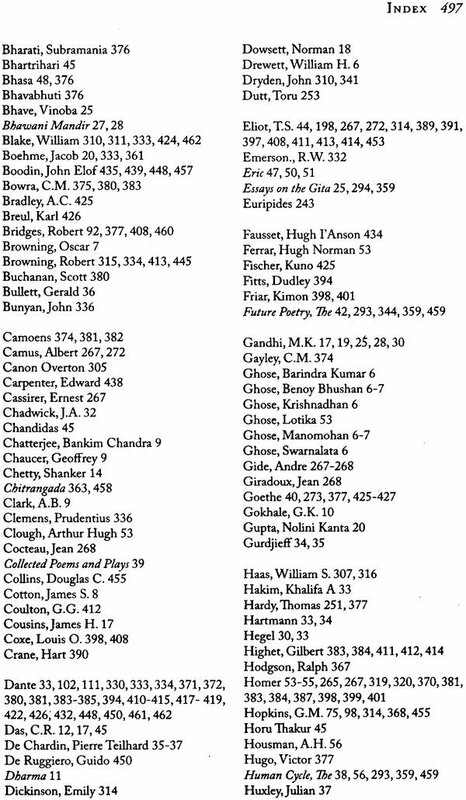 Dante, among the poets of the past, comes closest to Sri Aurobindo, and I found the essays on Dante by T.S. Eliot and Alien Tate the most illuminating, though Charles Williams is very good too. 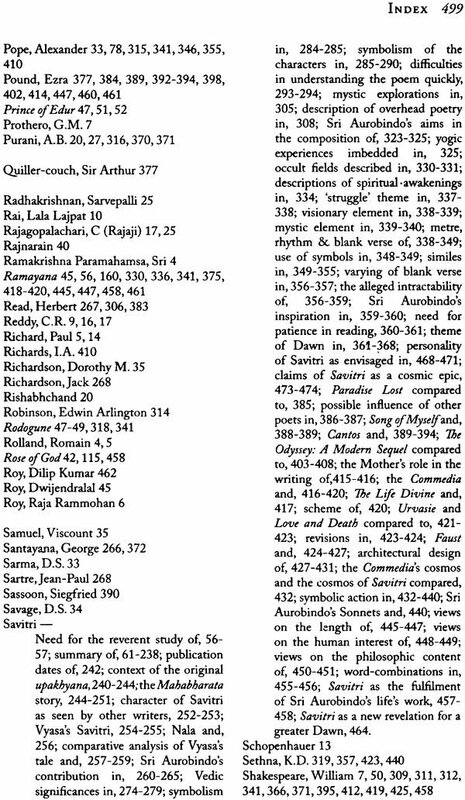 Of the modems, Ezra Pound and Nikos Kazantzakis challenge comparison with Sri Aurobindo as epic poets. I have therefore made an attempt to see both the Cantos and 'Ibe Odyssey: A Modern Sequel, in relation to Savitri. Last to be written was the first chapter on Sri Aurobindo's life and work: while writing it I was conscious of what I had already written in the later chapters, and hence some points have been only glanced at since they are anyhow dealt with in fuller detail at the appropriate places later on. My main difficulty has been narrowing down the subject and at the same time setting it in the right backgrounds. This is no study of Sri Aurobindo or of his philosophy or yoga or politics, not even a study of his poetry as a whole. 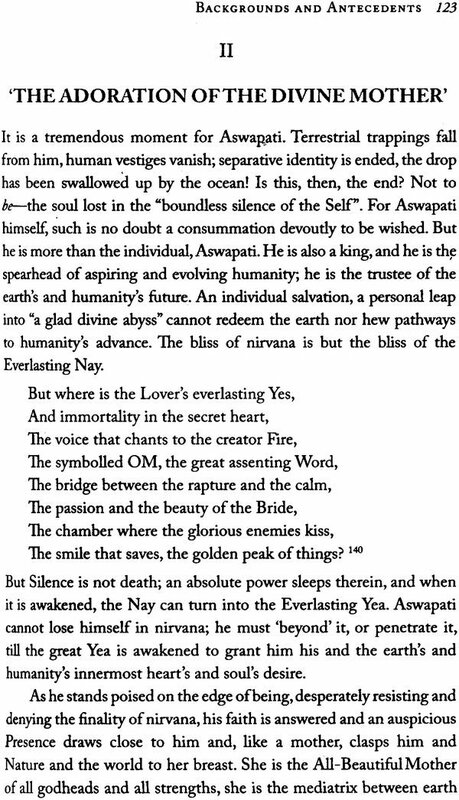 The single poem, Savitri, is the subject; and Sri Aurobindo's life and thought, his philosophy and yoga and politics and his other poems, are brought in only to make the appreciation of Savitri easy or complete. 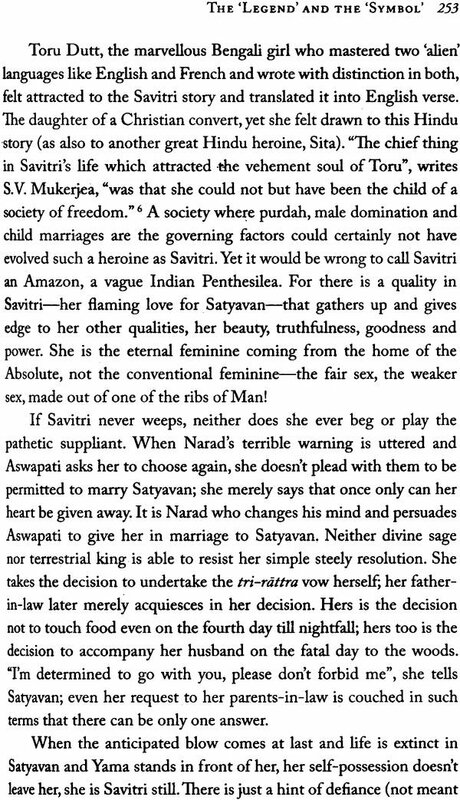 But Savitri is an epic in the English language, and it cannot be studied in a cultural vacuum. Savitri by itself, Savitri in relation to Sri Aurobindo's life and work, and Savitri in relation to the currents of human thought and experience of all times: such are the three ascending terms in the argument that I have tried to present in the following pages. Sri Aurobindo's yoga and his philosophy were no 'freaks' but are paralleled by similar (though not identical) realisations and leaps of thought elsewhere. Thus, while claiming outstanding genius and originality for Sri Aurobindo, I have been at some pains to show that, far from being a 'crank' or a 'case', he was generally in the line of the great mystics, philosophers and poets of the world. For example, when I had almost completed my thesis, I came across Pierre Teilhard de Chardin's The Phenomenon of Man, and I was surprised to find striking similarities between his and Sri-Aurobindo's speculations, to which I have drawn attention in the course of the first chapter. In The 'Legend' and the 'Symbol', I have tried to show that Sri Aurobindo's Savitri, massive though it is in conception and impressive in execution, is in its main ingredients implied in the old legendary story, even as the colossal Indian banyan tree is essentially implied in its tiny seed. As regards the symbolism, I have striven to show that Sri Aurobindo has drawn freely from the rich storehouse of Vedic symbolism and fused the many derived symbols into a single new blaze of revelation. 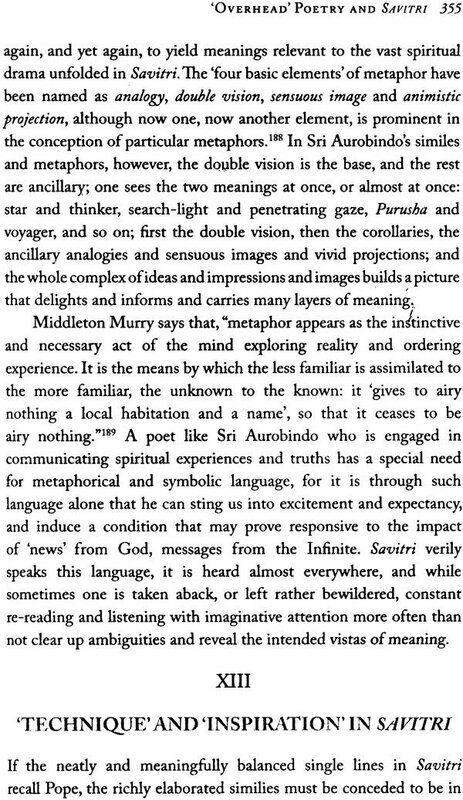 In 'Overhead' Poetry and Savitri, again, I have endeavoured to show that as 'overhead' poetry involves, first 'thematic content', second 'language' or verbal expression, and finally 'rhythm', in Savitri the 'content' is mainly Sri Aurobindo's own yogic experiences (including the journey in consciousness and the spiritual struggles in the mystic's 'Dark Night of the Soul'), the language is symbolic, often drawing upon the Vedic symbolism, and the rhythm is iambic blank verse, but with an Upanishadic and Kalidasian force and finish. But 'overhead' poetry is not, after all, a wholly new bag of poetical, tricks, but rather the pushing up of certain possibilities in all great poetry to a further height and consistency of profoundly moving utterance. This point too I have tried to make in the course of the chapter, with illustrations from poets of the ancient and the modern world. 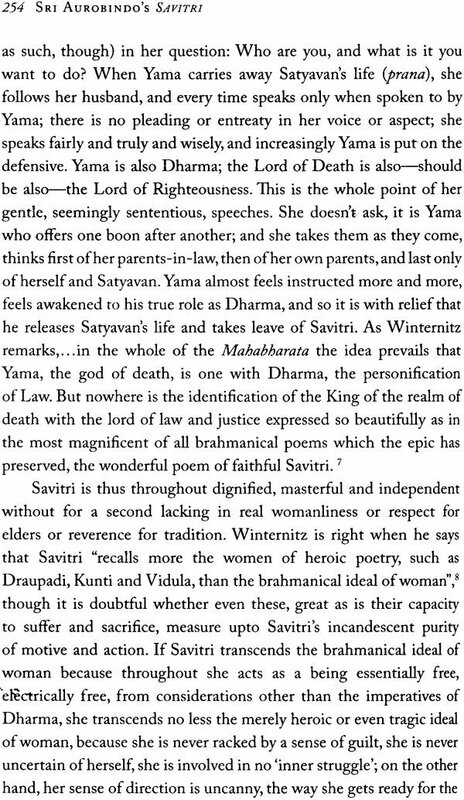 Finally, in Savitri: A Cosmic Epic, I have done my best to show that Savitri is an epic of the soul with a range that is truly cosmic, and that, while it recalls for one or another reason many of the epics of the past and of the present-day world, still the Divina Commedia comes nearest to it in its scope and depth and quality of its poetic utterance. The essence of the celebrated Gayatri (or Savitri) mantra is that by meditating on Savitri the adorable Supreme Creator of the Universe, the devotee invokes the intercession of that Power to awaken the veiled indwelling Effulgence to guide the mind towards the Truth. The Supreme Creator is also the veiled slumbering Effulgence; as a result of the divine intercession, what is slumbering is awakened, what is veiled is revealed, and man returns to the sovereignty of the Spirit. Sri Aurobindo is thus able to make his poem at once the story of Savitri and Satyavan, and the story of Man in the Universe: in short a human and a cosmic epic in one. ... two very general caveats for the critic, which are also caveats, to a slightly lesser degree, for the common reader. The first is that we ought to make quite sure, before we undertake the microscopic investigation of a writer, that he is, for ourselves, worth investigating-which means, that we have enjoyed and been impressed by his work. And the second caveat is that the ways in which the person affects and is revealed in his creations are enormously varied and subtle; the evidence, however lavish, is never, in the nature of things, complete; and it behoves us, therefore, however fearless we may be in our pryings, to be cautious in our conclusions. I can at least-say that I have genuinely enjoyed, and have often been overwhelmed by Savitri; I can also say that after all this exploration and scrutiny, I still feel that there is a lot more to know, that all the 'facts of the case' are not ready to .hand; and if the poem intrigues me still in many places, if I feel constantly baffled, the reason may very well be that I do not know all the facts, that perhaps I have not even had the patience or perseverance to look for them in the right places. The poetry of Savitri is the reality, my critical study is but an illusion, but I hope, an illusion not wholly unrelated to the Reality! When a philosopher discusses literature he often reveals a want of taste, but when a man of letter discusses ideas he sometimes reveals a want of precision. By helping one another We shall perhaps draw nearer to that state of grace in which love increases as understanding becomes clearer, and understanding is all the clearer as love is the more profound. Great writers expect no less of us, for their ideas are bound up with their art, and their very greatness consists in the fact that after they have gone their thoughts remain inseparable from the manner in which they have expressed them. 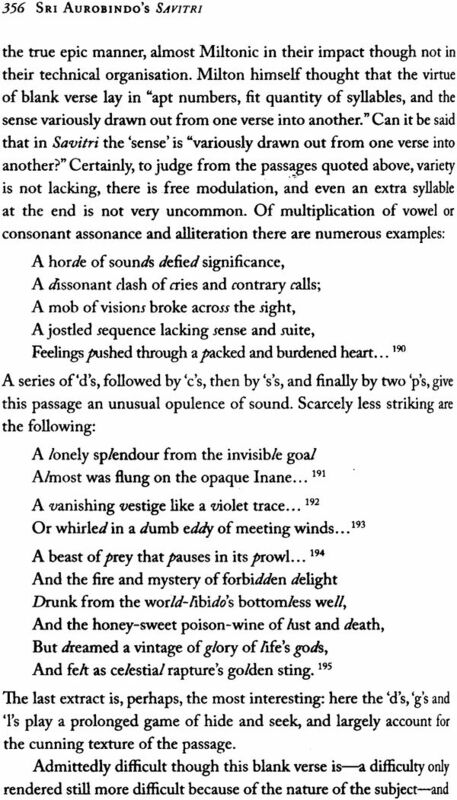 Being neither a philosopher nor a litterateur but only a hesitant student attempting the double approach, it is possible that my argument lacks 'precision' and 'taste' both; but at least I have not failed to hanker after 'that state of grace' to which M. Gilson refers. 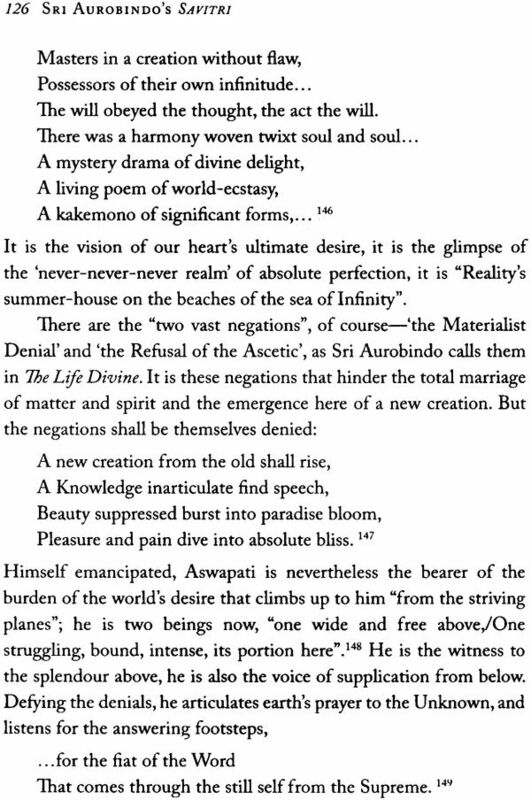 Again and again, amidst others, two names-Dante and Sri Aurobindo - are brought into juxtaposition in my thesis, sometimes deliberately and sometimes by accident, as it were; and re-reading the whole thesis, I ask myself whether the crest of the winding argument is not, in effect, to hail Savitri as a modern Divine Comedy. With love, and struck vast chords upon her vibrant lyre. At the very first sight I could realise he has been seeking for the soul and gained it, and through this long process of realisation had accumulated within him a silent power of inspiration. His face was radiant with an inner light and his serene presence made it evident to me that his soul was not crippled and cramped to the measure of some yrannical doctrine, which takes delight in inflicting wounds upon life. Tagore was an international figure, a Noble laureate and twelve years Sri Aurobindo's senior in age. 'homage' is, therefore, all the more striking. 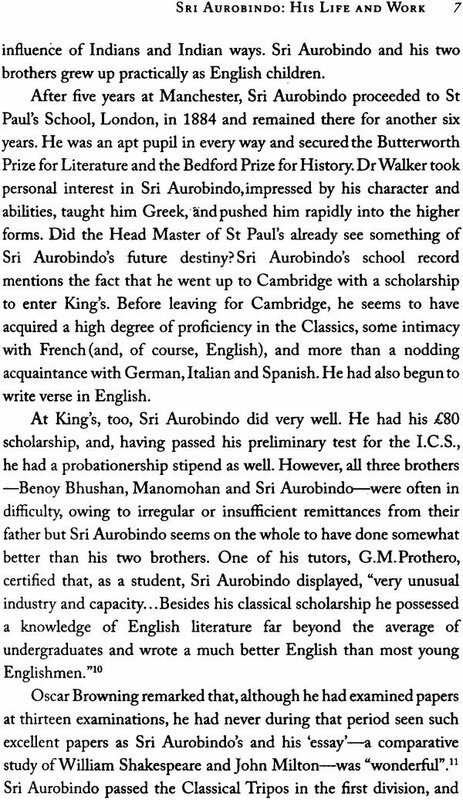 Sri Aurobindo was not like other men. The heroic fighter of 1907 had become, by a mysterious process of spiritual alchemy, the rishi of 1928. 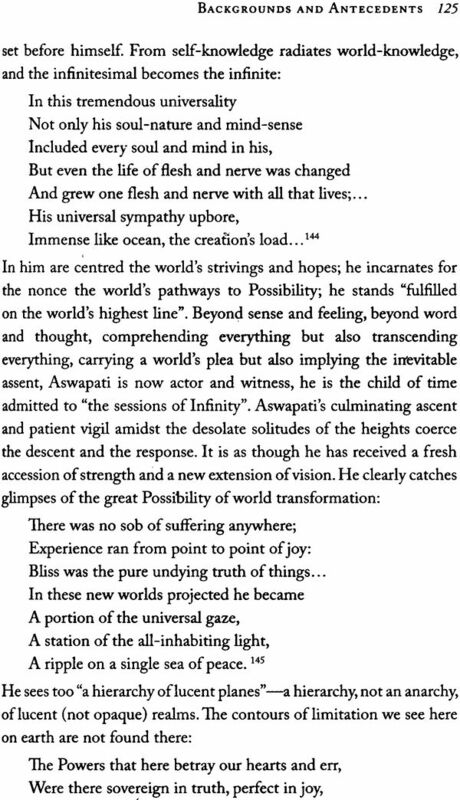 He had indeed become the Soul of India. Again Henry Miller has recorded that, "he experience which stands out most strongly in my mind is the reading of Romai Rolland's two volumes on Ramakrishna and Vivekananda," Sri Ramakrishna Paramahamsa was a god intoxicated man, a saint who seized the Kingdom of Heaven by violence. Swami Vivekananda was his principal disciple and interpreter, his spiritual heir and his tempestuous St Paul. 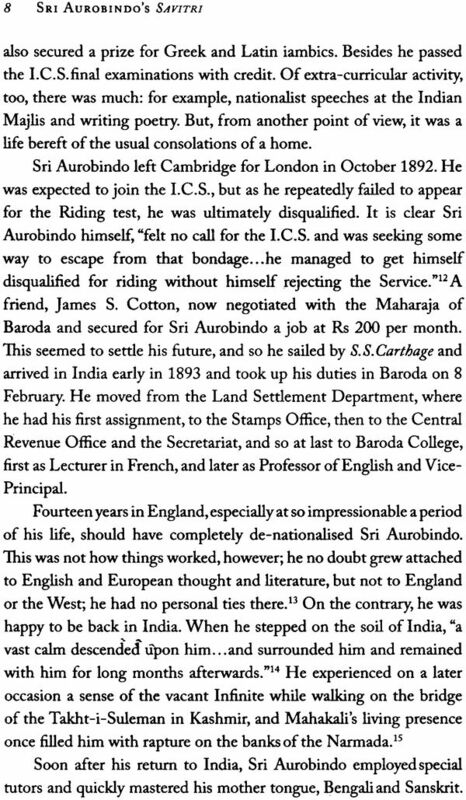 Sri Aurobindo continued, and in a way completed, their work. 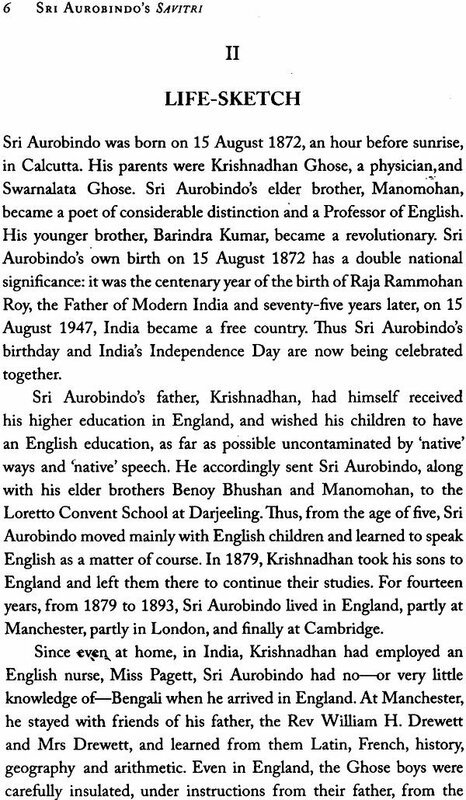 Romain Rolland himself described Sri Aurobindo As, "the most noble representative of this great Neo-Vedantic spirit---the foremost of India thinkers," and also as, "the completest synthesis that has been realised to this day of the genius of Asia and the genius of Europe," and as the last of the great rishis who held "in firm unrelaxed grip, the bow of creative energy." The hour is coming of great things, of great events, and also of great men, the divine men of Asia. All my life I have sought for them across the world, for all my life I have felt they must exist somewhere in the world, that this world would die if they did not live. For they are its light, its hear, its It is in Asia that I found the greatest among them-the leader, the hero of tomorrow. He is a Hindu. His name is Aurobindo Ghose. He is not an armchair philosopher, but man who, having led a life of intense activity, has retired to brood over it, if one may say so of a Hindu, in dim light of a Gothic cathedral. In fact, he is new type of thinker, one who combines in his vision the alacrity of the West with the illumination of the East. TO study his writings is to enlarge the boundaries of one's knowledge. Not only did Sri Aurobindo combine the spiritual fervour of Ramakrishna with Vivekananda's intellectual vigour, he also brought the East and the West into full creative partnership. The Hindu brooding in the dim light of a Gothic cathedral: the Indian forging the links between the thought of the East and the thought of the West: the Bngali writing in the English language with a singular mastery of phase and rhythm: a Lighthouse of the Spiritual for the East as well as the West. How shall we account for this truly unusual phenomenon?